When most people think of summer vacation they think of swimsuits, cold drinks, exotic locations and the warm sun. However, living in an area of California where the mercury rises to 100+ degrees for weeks at a time, the sweetest vacation for my family is a quick jaunt to the central coast where the temperature dips and the mornings bring thick, coastal fog. This mild-weathered retreat is Manresa Beach, located about 10 miles south of Santa Cruz. Sure, we get our bright, sunny afternoons but come 7pm when you want to catch the killer sunset, you need something warm to cover yourself up. 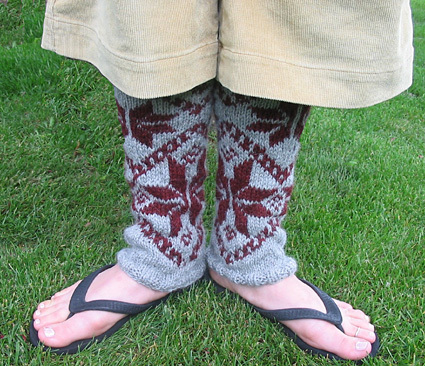 Here on the beach, with a glass of wine in hand, the idea for the Manresa Legwarmers was born. Knit in the softest alpaca on slightly larger-than-called-for dpns, you get a light, drapey fabric made extra warm because of the Fair Isle work. 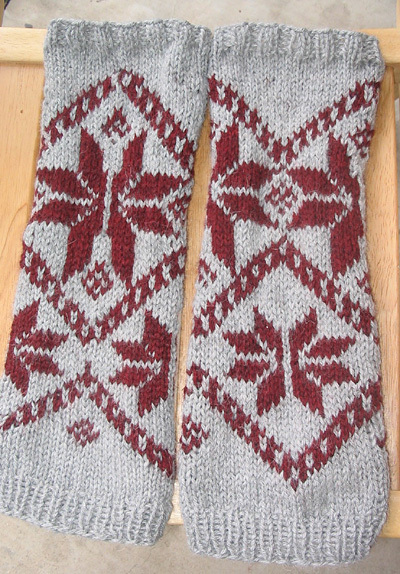 A retro pair of cross-country ski socks I found in my mom's closet inspired the pattern but the legwarmer shape is modern, and perfect to wear with your flip flops! When working the stranded colorwork pattern, be sure the yarn floats at the back of the work are LOOSE. The fabric must remain stretchy. Using MC, CO 48 sts. Distribute sts between needles and join to begin working in the round, being careful not to twist. Work 8 rounds in 1x1 Rib. Next Round: K6, [kfb, k11] 3 times, kfb, k5. 52 sts. BO all sts loosely in patt. Weave in all ends. Block lightly. When worn, CO edge of legwarmer is upper edge. Delia wishes she could retire at age 28 and move to the beach permanently. When she isn't convincing the youth of the nation to go to college, she sips red wine, knits toys for her cat, and fights the daily urge to buy yet another pair of shoes.